We could give you 500 reasons to buy a Vermeer mini skid steer, but you’re going to want to visit your Vermeer dealership to see for yourself. Enter the Vermeer Mini 500 Sweepstakes! Complete a demo to claim $50. Enter for a chance to win one of 25 $500 VISA® gift cards. Gift card recipients will also have the chance to win the grand prize: a free one-year membership with the National Association of Landscape Professionals (NALP) and a trip to the NALP Leaders Forum. Purchase a Vermeer mini skid steer to take advantage of low financing offers for a limited time only. 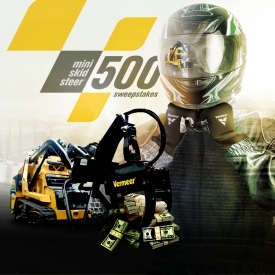 Visit Vermeer.com/mini500sweepstakes to schedule a demo and claim your $50.